Jose is a reasonable man. He has an above average IQ. He suffers from no mental illnesses. He has not endured any recent head trauma. So he knows that it is simply not possible that the Red Sox are actually considering trading Man-E-Faces Ramirez AND PROSPECTS for Aubrey Huff and Mike Cameron in a three way deal. (Note: Normally, Jose supports three ways on principle, but this he cannot abide.) He knows this can’t possibly be happening because in order for the Red Sox to actually make this deal, they would have to have reached the conclusion that the consequences of having Manny out of the line up for one game are so grave, so deleterious that the only solution is to get is bat out of the line up for every game henceforth. And that’s just plain silly. In other news from the Two Minutes Hate, the Red Sox have decided to treat Trot Nixon’s strained oblique with leeches and announced that Oceania is at war with Eurasia and always has been. As Jose left last night’s game (note: with a 7-1 record), he heard a yokel on his cell phone exclaim that Manny had been traded to the Mets. Jose’s heart sank, and his bile rose along with his blood pressure. If Jose’s friend Tom had not learned right then with his new fangled Internet phone that the deal had not been completed, it is quite possible that Jose would have had an aneurysm right then and there and spent the rest of his life wearing a batting helmet while writing KEYS… you know just to make sure he doesn’t get hit by any screaming line drives while he is working. In the final analysis, this trade is so lopsided, so manifestly bad for this year’s Red Sox that Jose half expects to hear that the Mets have agreed to throw in Center Andrew Lang to sweeten their offer. 1. Before everyone gets all bent of shape about the story that Manny Ramirez has asked for a trade (note: oops, too late) can we at least consider the possibility that this is not what it sounds like? Maybe Manny didn’t actually request a trade to another team. Did you ever think about that jerks? Maybe he was simply requesting that Theo trade him a 1984 Lou Whitaker Topps baseball card for a 1991 Bobby Thigpen card. (Note: Or maybe Jose made that trade, it gets confusing.) Maybe, he thought he was calling his broker and demanding that he make some trades rather than keeping his portfolio static? Maybe, he was expressing his support from the Central American Free Trade agreement. See, we don’t really know. Sure, we could believe the simplest possibility, that he wanted a trade to another team, but doesn’t that seem like we’re not giving Manny enough credit for being the nuanced, complicated man of the world that he is? And another thing, what’s the deal with all of the demands that the Red Sox stop letting “Manny just be Manny?” In all of the columns voicing this opinion, Jose has not read a single suggestion of who the Red Sox should be pushing Manny to be if not himself. Should he be Mike Greenwell, Tory O’Leary, Bob Zupcic or any of the other bad to mediocre players who played left after the departure of Jim Rice? Is that what people really want? Should he be Alfonso Soriano? Cliff Floyd? Mike Cameron? Any of the other inferior players we could get for him? Wasn’t Manny just being Manny when he hit the key home run off Barry Zito in Game 5 of the 2003 division series? Wasn’t he just being Manny when he won the World Series MVP? Actually, he reminds Jose a lot of another Manny – Man-E-Faces, who, as best Jose can recall, was a He-Man character. The deal with Man-E-Faces was that he had three faces each representing a different aspect of his identity. There was the human face that was kind and good and decent, a monster face that was evil and cruel, and a robot face that was mechanical, cold and neutral. To get all of the good things that came with the human face, He-Man and pals needed to put up with the fact that he occasionally became a rampaging monster or a so-so robot. And you know what? They did. They did because it was worth it. Yes Man-E-Faces Ramirez has multiple faces. Sometimes he’s the fearsome slugger we love, some times he’s the disgruntled, aloof diva we hate and sometimes he’s the clod in the outfield we both love and hate. But does the good outweigh the bad and the neutral? Jose thinks so. So before everyone runs Ramirez out of town, think about those faces, and then think if you really want him working for Skeletor. 1. It was a rough day for Antipope Clement XV. Not only did he take a line drive off the side of the head, but Jose learned that he is not even the first Antipope Clement XV. Apparently, in 1963 an excommunicated French Canadian named Michel Colin named himself Pope Clement XV in protest of Vatican II. (Note: Or did he name himself Pope in protest of Big Audio Dynamite 2, it gets a little murky.) Since he had been excommunicated, he was regarded as an antipope, a minor antipope, but an antipope nonetheless. Still, Jose will continue to address Matt Clement as Antipope Clement XV rather than increasing him to Antipope Clement XVI. He had a hard day, and he doesn’t need any more stress. While the accident looked terrible, and must have felt terrible, Jose is very happy to hear that the damage does not, thus far, appear to be serious. Jose had a feeling it wasn’t as bad as it could have been as soon as he noticed that no one tapped Clement with a mallet to determine whether he was alive or not and certainly no one smashed his papal ring. With that out of the way, we can now focus on the fact that Clement has received no credit for stopping the ball. Sure it went in to left field, but he did a great job of making contact with it. Why is it that what would be called a terrific header in soccer, a vicious headbutt in wrestling or an illegal headbutt in boxing is regarded in baseball as a terrible accident? Sure the ball is traveling 110 mph and can pulverize bone, but that shouldn’t change anything. Jose congratulates Matt Clement on his brilliant header, and hopes that he gets well soon. Also, Jose suggests that next time you try a bicycle kick; it looks cooler and hurts less. 1. Here’s an interesting factoid on tonight’s Red Sox starter. Did you know that he was the founder of the Macedonian Orthodox Church? It’s true, Jose just looked it up and it turns out that St. Clement is the guy. Jose will confess that he is a little bit confused, as Clement was, as best he knew a pretender to the papacy, you know Antipope Clement XV and all, and all that, and thus a Catholic or at least a Catholic heretic, rather than Orthodox Christian. But thankfully Jose has a solution to this seemingly irreconcilable paradox – it’s religion, it doesn’t have to make sense!!! Jose’s biggest regret from his trip to the Balkans is that he did not have a chance to visit the monastery of St. Clement in Plaoshnik. He would have liked to have lit a candle, laid a baseball at his tomb, done something. But what implications does this revelation have for tonight’s game? Well, first of all, it turns out that Clement was born sometime between 830 and 839 AD, meaning that he is a little bit older than the Red Sox realized when they inked him to a multiyear deal. This certainly explains his history of scuffling in the second half of the season, so look for Sox manager Terry Eurona to keep him on a short leash tonight. Another major issue is that the Serbian Orthodox church does not recognize the Macedonian Orthodox Church as being autocephalous, insisting instead that it falls under the Serbian church’s authority. So Jose is concerned that when Clement pitches tonight he may have Patriarch Pavle on the brain. 2. 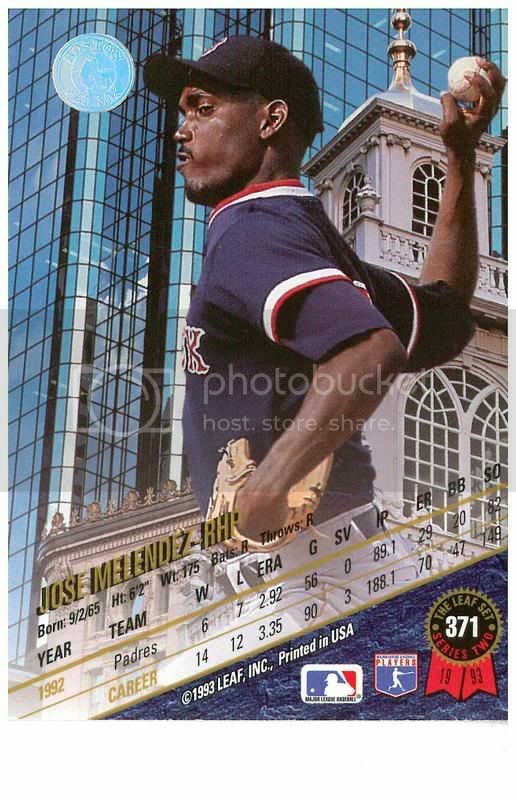 Jose is excited about the Red Sox signing of reliever Craig Hansen out of St. John’s University. Not only is it possible that he could pitch in the majors as soon as this August, but it is also possible, or maybe even probable that he could perform his hit single “Mmmbop” with fellow Sox musician Balki Arroyo during the seventh inning stretch some balmy August evening.